This article is to help diagnose any problems you may come across when setting up Messenger campaigns with LandingCube. If you click "Preview in Messenger" and your sequence doesn't run, there are several things that could be the cause. 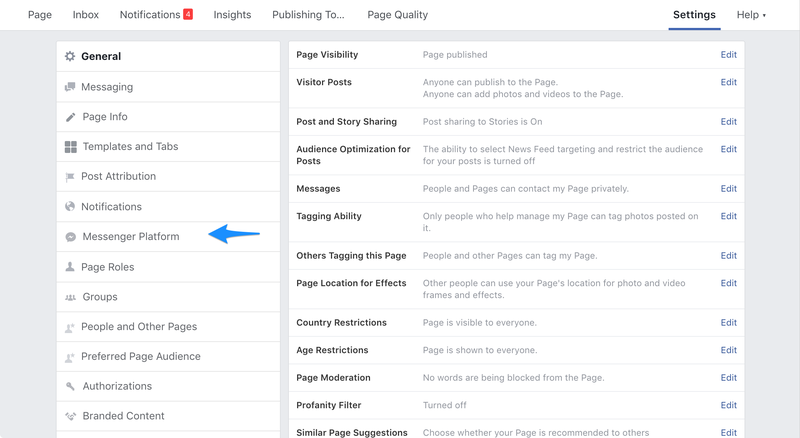 First, check that the Facebook page you selected when setting up your campaign in LandingCube is the same as the Facebook page used for the Ad in Facebook Ads Manager. It must be the same page in each space for your sequence to function properly. A common issue is when the original code (in Ads Manager) is not fully removed when adding the code from LandingCube. This results in a duplicate of these opening tags, and thus the code will not work properly. Ensure you click at the very top of the code, to replace the entire code with your campaign's JSON code. JSON editor doesn't give any error message, yet the code isn't firing when you test the campaign? If this happens, it is often because your Facebook page has not authorised our app to connect and send messages. Check if a few things are set up correctly. Go to your Facebook page's settings, and click on "Messenger Platform". Click on "App Settings". It should give you options for "Primary Receiver for Handover Protocol" and "Secondary Receiver for Handover Protocol". You should ensure that both of these have no app selected. Finally, scroll down to "Whitelisted Domains". The domain "deliciouspromos.com" should appear here.